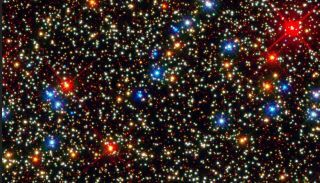 The tiny blue stars shown in the globular cluster of Omega Centauri can't be seen in distant galaxies, but new findings show they dominate in early ellipticals. A formula that astronomers have long used to determine how much mass galaxies had at their birth may not be as dependable as scientists once thought, a new study suggests. The study, which took a close look at 260 early galaxies, found that the distribution of stars in early galaxies is actually different from galaxies that formed at a later time in the universe — a finding that could change our understanding of how galaxies evolve. At the center of the perplexing star story is an astronomical formula known as the initial mass function, or IMF. The formula helps astronomers determine the mass of stars within a galaxy, which can then be used to measure the galaxy's growth over time. Working on a project to understand the formation and evolution of the oldest galaxies, an international team of astronomers has been studying spherelike elliptical galaxies, as well as the lenticular galaxies that combine features of the ellipticals with their younger, spiral cousins. "We found that these two methods do not agree," study co-author Michele Cappellari, of the University of Oxford in the United Kingdom, told SPACE.com by email. The distribution of low- to high-mass stars was three times more massive in the older galaxies than in younger galaxies within the survey. The younger elliptical and lenticular galaxies had results similar to spiral galaxies like the Milky Way. The researchers found that the older galaxies have a larger fraction of low-mass stars than their younger counterparts. "Small stars are numerous, and so provide a lot of mass, but little light," Cappellari said. Located tens to hundreds of millions of light-years from Milky Way, the galaxies are a glimpse into the past, because their light is only now reaching us. Elliptical galaxies are at the end of their evolution. With less dust than spiral galaxies, they have less star formation and thus fewer young stars. The researchers determined that the initial mass function, long thought constant across galaxies of all types and ages, in fact varies for these older stellar groups, a finding with profound consequences. "The IMF is necessary to convert the light we observe from galaxies into the stellar mass that all models predict," Cappellari said. "Up to now, astrophysicists assumed this conversion could be performed with a universal IMF." But doing so can produce errors up to a factor of three. "Current models use the wrong galaxy stellar masses in the comparison, and will have to be revised," Cappellari said. The reason for this variation remains a mystery. Star formation — and galaxy evolution — involves a number of complex factors, ranging from hydrodynamics to the effect of radiation and the chemistry of nuclear reactions. Its complexity makes it difficult to model. According to Cappellari, this is "computationally infeasible." "It may take years before astrophysicists converge on an explanation," she said. Regardless of the cause, the findings will necessitate another look at existing models of how galaxies grow and change over time. "What seems clear … is that the oldest galaxies in the universe formed their stars in much more dramatic and intense events, while spiral galaxies formed stars more quietly for the major part of their lives." The research will be detailed in the April 26 issue of the journal Nature.